Sunny Thakkar is a New York licensed physical therapist at Professional Physical Therapy. Sunny graduated from University of Pittsburgh with a master’s in Musculoskeletal Specialty. Sunny has been practicing for 9 years and specializes in Musculoskeletal, Orthopedic, Sport injuries, and Post-surgical rehab. Natasha Commissiong is a NY licensed Physical Therapist at Professional Physical Therapy. After graduating from Temple University with a B.S. in Kinesiology, Natasha went on to receive a B.S. in Health Sciences and a Doctoral Degree in Physical Therapy at Touro College. Natasha has been practicing for six years and specializes in Orthopedic cases, particularly post-operative. Natasha is also a member of the APTA. Francesca Bongailas is a NY licensed Physical Therapist at Professional Physical Therapy. After graduating from Quinnipiac University with a B.S. in Health Sciences, Francesca continued on to receive her Doctoral Degree in Physical Therapy. Francesca specializes in Sport related injuries and post-ops and has certifications in LE Mulligan and Graston. She is also a member if the APTA. Angie Suguitan is a NY licensed Physical Therapist at Professional Physical Therapy. After graduating from the University of La Salette with a B.S. in Physical Therapy, Angie went on to receive her Doctoral Degree in TDPT at Arcadia University. Angie specializes in Orthopedic and Post-op cases and has certifications in NKT and SFMA. Angie is also a good-standing member of the APTA. Emily Wulwick is a New York licensed Occupational Therapist at Professional Physical Therapy. Emily graduated from Touro College with a Masters Degree in Occupational Therapy and specializes in Post-surgical care, orthopedic splinting, repetitive strain injuries.Emily has certifications in Hand Therapy and she is also a good-standing member of the AOTA. 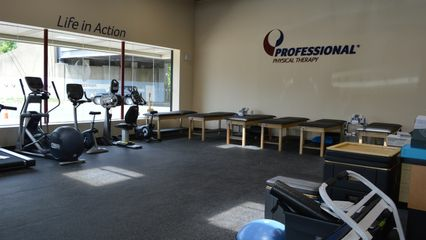 Christina Machado is a New York licensed Physical Therapist at Professional Physical Therapy. After graduating from Fordham University with a B.S. in Biological Studies and Psychology, Christina went on to receive her Doctoral Degree in Physical Therapy at New York Institute of Technology. Christina specializes in general orthopedics, neuro-rehabilitation, oncology rehabilitation, treating endurance athlete related injuries involving the hip, knee, and ankle and has CSCS and SFMA Level 1 certifications. Christina is also a good-standing member of the APTA, National Sports and Conditioning Association, the Selective Functional Movement Analysis and the United States America Triathlon. Christina is the co-author of an article recently published in the International Journal of Sports and Physical Therapy about the effects of blood flow restriction training on functional improvements in an active single subject with Parkinsons Disease (April 2018).